JINJA- The Uganda National Roads Authority (UNRA) over the weekend conducted a static road test on the new Nile Bridge in Jinja. During the test, 26 trucks loaded with murram; each weighing 25 tonnes crossed the bridge concurrently — to determine the bearing capacity. Dual carriageway was loaded in the centre span of the bridge with 13 trucks on each side which were full of marrum as the static load testing was carried out. Trucks were also loaded on one side to check the load on one lane in case another lane gets a problem, such as an accident–making it impassable for vehicles. Each truck was carrying 25 tonnes of marrum and the total of the load was about 650 tonnes that they used to test the bridge. The testing was made in order to ensure the bridge is working normally before its commissioning. During the test, the heavily loaded trucks crossed the bridge concurrently for more than 30 minutes to determine the bearing capacity. There were no cracks detected; which meant that the bridge is ready for use. “After the static load testing, results indicated that the bridge can carry the designed load capacity of vehicles that will pass on it,” said UNRA engineer Lawrence Pario. He also added that Ugandans and other road users should not get scared that the bridge might break. Permanent works which include installing the cables that join the bridge from Njeru to Jinja as well as the 2.6km road leading the public to the bridge making it ready for use is complete. The bridge has a structural health monitoring system for example very tall structures called propylene supporting the cables, sensors called inclinometer which will help in detecting whether pylon is moving in one side or it is in one position. “At the moment, we are fitting the bulbs on the electrical lighting poles and also fixing weigh-in motion system. “We do not want to stop the vehicle in order to know the weight of the load that particular vehicle is carrying; we want the vehicle to drive over and we will automatically get the weight from the system,” Morris Odrua, the bridge and structure (UNRA) engineer explained. Odrua added that when the vehicle is over loaded, they will have the vehicle apprehended on the other side of the bridge. Before the construction started in 2007, many people got concerned that the old bridge could betray us by breaking and there would be no alternative connection except using Mable, Soroti and Karuma before coming to Kampala. The government decided to build a new bridge across the Nile with the help of the Japan International Cooperation Agency (JICA) to secure traffic and transport along the Northern Corridor Route and enhance trade volumes with East African countries. Zenitaka Cooperation of Japan and Hyundai Engineering and Construction Company from South Korea constructed the bridge. Construction started in January 2014. The total cost of the bridge was about Shs 390 billion with the government of Japan financing up-to 80% of the cost in form of a loan while Uganda was supposed to fund the remaining 20%. The new bridge which is also referred to as the second Nile bridge will replace the Nalubaale bridge that was built in 1954. 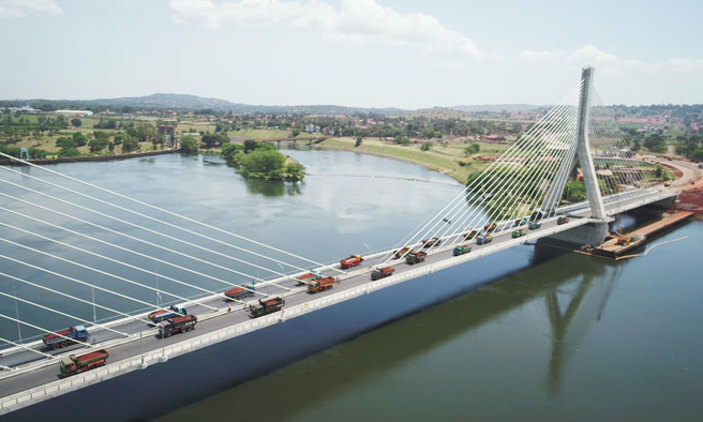 The 525 meter-long bridge is the first cable-stayed bridge in East Africa crossing Victoria Nile and linking the Northern Corridor that connects Kenya with the Democratic Republic of Congo (DRC). The bridge was designed with a structural lifespan of 120 years. It will be the longest single plane configuration in the entire African continent. It has a central span of 290m, end spans of 135m and 100m on the East and West banks respectively. The bridge also has a dual carriageway 7m wide with a pedestrian walkway of 2.25m wide on both ends. For security at night, the bridge will have lighting facilities. The bridge’s foundation of 1.5m and 2.0m diameter piles are embedded approximately 14 – 23m deep into the hard rock. The new 1.83km long asphalt approach roads have three at-grade junctions at Nile Breweries, Nytil and Jinja roundabout to allow interchange of traffic to the existing road network. The high-quality infrastructure is expected to promote the economic growth of Uganda and East African countries through enhancing the smoothness of transportation on the northern corridor and also ensure transportation and safety. The bridge is also expected to enhance tourism in the country due to its beauty. However, the old Nalubaale Bridge will continue to be used until October 17 when it will be closed to traffic as the new Nile Bridge will pass vehicles more safely and eight times faster. UNRA’s Executive Director Allen Kagina confirmed that President Yoweri Museveni will commission the bridge on October 17.